One thing was clear about the Learning History event. Though we had gathered to explore 5 inspirational stories, the participants themselves brought many interesting stories of initiatives in which they had been involved or knew. "Be careful not to iconify those few examples" was a strong message that was fed back when participants were asked on that first evening how they felt about the 5 stories featured. 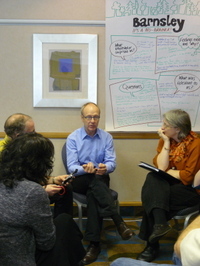 Read about participants reactions to 'inspiring stories' here. In small groups, participants each told a short story and these stories were taped and have been transcribed. Click on the storytelling category to read some of these inspiring stories. Explaining....What is a Learning History? A Learning History is an action research approach to learning that seeks to bring analysis and story together in a way that has value for those originally involved in the case as well as those seeking to learn from it. The approach was originally developed by researchers, Roth and Kleiner from MIT’s Society for Organizational Learning and was further developed by Hilary Bradbury in her doctoral work (Roth and Kleiner 1998; Bradbury 2001). Roth and Kleiner coined the term ‘learning history’ describing it as a way to get past listing best practice and more into the ‘thinking, experimentation and arguments of those who have encountered the situation’ (Roth and Kleiner 1998). The learning history has been used to good effect in many settings in the industrial sector (e.g. at a large US auto manufacturer) and the social sector (e.g. at The Natural Step). A learning history has, to-date, mostly been applied within one organisation and in the private and NGO sector. By contrast, in this research, learning history is being applied across 5 different organisational settings within Local Government in the UK. The examples being charted are where innovative carbon reduction has taken place. They involve low-carbon technologies in some way. This Learning History then is just one of in a series. The individual histories may be partial – sometimes not fully describing all aspects of the innovation in question. However the totality of the series aims to paint a picture of how innovation for carbon reduction comes about across different contexts. It seeks to present this picture in a way that increases the potential for learning and action. Read how a Learning History differs from a Case Study. Read about the ethical dilemmas posed by working with individual stories. Read about how this research got started. Bradbury, H. (2001). Learning with the Natural Step: Action Research to Promote Conversations for Sustainable Development. Handbook of Action Research. P. Reason and H. Bradbury. London, Sage Publications. Bradbury, H. and C. Mainemelis (2001). "Learning History and Organizational Praxis." Journal of Management Inquiry 10(4): 340. Connelly, M. and D. J. Clandinin (1999). Narrative Inquiry: Experience and Story in Qualitative Research. San Francisco, Jossey Bass Wiley. Roth, G. and H. Bradbury (2008 (in preparation)). 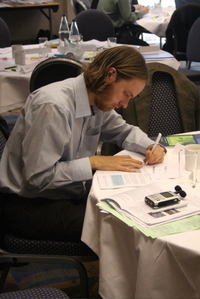 Learning History: An Action Research Practice in Support of Actionable Learning. Handbook of Action Research. P. Reason and H. Bradbury. London, Sage. Roth, G. and A. Kleiner (1998). "Developing Organizational Memory Through Learning Histories." Organizational Dynamics 27(2): 43-60. Van Maanen, J. (1998). Tales of the Field. Chicago, University of Chicago Press. As far as I know a Learning History hasn't been created online like this before. Hitherto it's been a written document. In written Learning Histories, like the individual Histories in this research, there are different commentaries: multiple voices and analyses are presented alongside a story thread. In this way the reader can pick and choose how they read the History - honing in on the parts that are most appealing to him/her. The categories on this Blog have been chosen to emulate the mix. Categories like 'reflecting', 'theorising', 'storytelling', 'analysing' relate directly to the different ways of representing you can see in written Learning Histories. This multi-threaded nature of a Learning History can be even more richly presented online. By selecting categories as well as working more from photos, a reader can more flexibly choose which mode of representation they wish to use to engage with this Learning History. A Learning History is as much a process of participation as it is an output. For this reason I have chosen verbs for the categories rather than nouns. I wanted to indicate that this is a live and evolving process. Online Blogging offers a dynamic quality that you don't get with a written document. I am deliberately choosing to expose the creation of this Joint Learning History as it goes along to participants. This feels risky - it feels personally exposing and also it's not usual to submit a blog as part of PhD. However I am doing this again in the spirit of experimentation and will reflect on some of this in the category 'researching'. It feels more congruent with the notion of participation to expose the creation of the History than to hide away and then reveal it at a later stage. The categories of 'participating' and 'taking actions' and 'questioning' particularly speak to the desire to involve or at least emphasize the voices of the many participants in this research. The use of photos directly from the workshop also emphasize this point. I want to present, in a coherent way, an uneditted view of participant's thoughts and comments. In summary then there are categories that relate to content: these relate to the individual learning histories and, as important, there are the categories that refer to different activities around those histories. In this way I hope to produce a Learning History that is inviting, even messier than normal, but truly a 'jointly told tale'. You can read a background story about how I got started with this Learning History research here. Return to the Welcome page that describes what this website is about and what you'll find here. There are also photo albums on the left hand side - click in to see photos of the workshop and material generated there by participants. The recent posts will show you the most recent entries on the website. The Archives store all the posts in monthly chronological order. The Categories let you access the posts by category. Find out what the categories mean by clicking here. Are you interested in this topic? Have a look around and leave a comment on any of the threads that interest you? Find out more about taking part in this ongoing online conversation. Every posting and page on this website has a comment box and participation in what is being discussed here warmly invited. Your views, thoughts, comments are welcome. The only groundrules are that comments are relevant, constructive and respectful - particularly when it comes to commenting on others' stories. To participate simply scroll down and add a comment on whatever posts interest you (you'll be asked for a screenname - this does not need to be your real name). 1. Are you trying to make change in your own organisation that will help bring about reductions in carbon? 2. Have you an interest in Local Authority innovation or a general interest in how we might innovate to reduce carbon? 3. Are you a participant in the research? 4. Would you like to read about other stories of innovations that have happened? Why not read some of the Learning Histories featured or the 20 mini stories of innovation featured on the site. 5. Have you read a Learning History and would like to comment or a question? 6. Or were you involved in a Learning History and would like to post a perspective? Add comments on any of the postings under the category for that Learning History. For example to add something about Merton visit the A Learning History: Merton Rule category or to add something about Barnsley visit the A Learning History: Barnsley Biomass category. 7. Have you read a story that resonates with something you have done? 8. Would you like to add your stories? 9. Are you interested in the theory of innovation? 10. Are you interested in Action Research, Learning Histories or new kinds of research approaches to Learning and making change? Are you interested in the findings of this research and getting involved in the ongoing conversation? Browse the different categories of the website and the albums and add comments wherever appropriate. Active reading - an important activity in its own right. 'Active Reading' is a term I've coined in this research to highlight that reading a Learning History is an important act in itself. The idea is to put a process in place that really encourages the reader to engage with the learning history on a number of levels. So whilst they may enjoy the story, they are encouraged to be critical and to notice and record their varied responses. This is in the interests of a richer learning experience. 'Active readers' are therefore briefed to set aside time, notice any feelings, thoughts and memories triggered by the read and they are encouraged to highlight, comment and make notes all over the document. Above all, active readers are advised that all reactions and responses are valid, however oblique they may seem. In the research active readers have read the histories and sent marked-up copies back to me. In this way I can see the way people are engaging with the learning history. At the participative workshop we asked participants to read one history in depth in this way. To get a feel for how they were responding, we then asked the participants to transfer notes they had made into a workbook. The workbook prompted for 'top of the head' reactions to the history. It asked too for comments relating to the history but also for comments relating to the 'active reader's' experience that he/she felt was related. We then copied the workbooks and now are in possession of a very rich collective response to the set of learning histories. A learning history is different to a case study in a number of ways. Firstly, as an account it really tries to get into the individual human story of what happened. It aims to present perspectives on a case rather than synthesizing several accounts into one dominant researched ‘truth’. So the ups and downs of individual experience are charted starting with perspectives from just one or two people close to the case. Their accounts are not presented as definitive or authoratitive. There are often gaps on detail; certain events are emphasised - others less so. In some of the Learning Histories I have balanced this by inviting, comments and stories from other people who were involved in the case . This multiple perspective approach is taken in the belief that human stories add accessibility to and demystify the happenings in a way that can be more empowering for the reader. It has its own challenges as you can read elsewhere in this blog. Secondly a learning history combines story and analysis. So it is a multi-levelled account. Alongside the story that is presented chronologically, quotes are included from those involved, together with researcher reflections and thematic analysis. The purpose is to create a lively account but also to derive a history that works at different levels. The thematic analysis that is run alongside the story provides the potential for analytical thinking and more conventional theory building to play its part in the research. Sometimes theory links are made. Finally, by using an action research approach, particular attention is paid to there being value for the various stakeholders in the research. These stakeholders range from those directly involved in the original learning history, to those with a different set of similar challenges elsewhere who seek to learn from it, through to other interested parties including academic audiences or those working in entirely different settings who might also find insights in the history here presented. In short this is not extractive research and the learning history is not an ‘output’ but a point around which the research hopes to gather interested parties. With this in mind, workshops, online support as well as smaller group work are organised and are considered to be crucial parts of the research process. Read the story of how I got started with Learning History research here. Posts are filed under different categories and usually they will belong to several categories at once. By clicking on one category you'll be able to see posts that just belong to that category. The categories have been chosen in such a way as to reflect an online version of a Learning History. Find out more about how these category choices reflect the desire to create an online Joint Learning History here. A learning history : (e.g. The Merton Rule): Any post that is related in some way to an individual Learning History. This could be a direct relationship e.g. a question resulting from reading it; or it could be an indirect relationship e.g. a story that someone is reminded of when they read the learning history. All learning histories : Any post that says something about the set of Learning Histories. This could be a theme or comment that applies to several learning histories or it could relate to the Learning History methodology. analysing - highlights themes that, either I as a researcher am finding across the histories, or themes that participants are highlighting as important in addressing carbon reduction. explaining - If you're lost - click on this category! In here are posts that are explaining background to the research, how the site is structured and so on. participating - a Learning History is a 'jointly told tale' (from Van Maanen's Tales of the field). There are several people participating in this research. In this category we refer to this process as well as introduce some of the participants. questioning - engaging with the research raises questions. These might be about an individual learning history, about carbon reduction in general or about ideas related to the research. reflecting - action research works in cycles of action and reflection. This category shows how particpants and the researcher are reflecting on the learning histories and on the process of the research. researching - this category will describe posts relating to the process of researching in this way. This is a new way of doing research. Some of the decisions, questions and challenges relating to the research will be posted here. storytelling - will hold different stories that are being told in relation to this Learning History research. Many of these were evoked in storytelling sessions at the workshop. But also stories of the research itself are included. taking actions - The purpose of the research is to aid learning and increase and enable participants and others to take actions. Any posts relating to taking action will be posted here. theorising - Some of what we are finding links to existing theories or, by analysing, we can start to build a practical theory of how innovation for carbon reduction comes about. Posts relating to theory will be categorised here. - Southampton's District Energy Scheme These can be downloaded from our project website here. Each of these individual history documents has an introduction that explains what a Learning History is, how it's being used in this research and also how it differs from a conventional case study. It was over 2 years ago now that I joined this research project at the University of Bath's Centre for Action Research (CARPP). Back then the project was called "Unlocking Low Carbon Potential"; now it's called "Lowcarbonworks" and we have a project website here if you'd like to know more. Either project title conveys quite well what the project is about. We had this underlying assumption that though decarbonisation inevitably involves technology, the barriers to moving in that direction are more likely to be psychological, social and organisational. We wanted to use action research to look at ways to not only understand these barriers better, but also to somehow address them. I was to set up some kind of research stream within this overall project direction. I started to read up on various theories that I thought might help us to understand how decarbonisation can come about. I read about organisational change theory, decision theory, evolutionary theory and topics like that. The more I read about this however, the more it seemed that whilst the lack of change might be very frustrating, it actually was completely normal. These theories were saying that 'Business as usual' is exactly what we should expect. So I decided to shape my research around examples of where carbon reduction really had happened and really try to get 'under the skin' of how these had happened. I thought that if we got right into the mess of human experience in these examples, we might get some interesting and useful learnings. Learning Histories, spearheaded by George Roth and Art Kleiner at MIT seemed a good way to do this. Read more about how they describe Learning History here. A colleague of mine at the centre, Rupesh Shah had used Learning Histories in his PhD Thesis and Hilary Bradbury, a well-known action researcher and friend of the centre at Bath had done some influential work with Learning Histories with the Swedish educational charity - the natural step. I read some of Rupesh's PhD quite early on. The librarian had grinned at me, I thought a tad malevolently, as she handed me the gigantic tome from behind the desk. But as I sat down and started to read, I became enthralled. I must have made for a strange sight in the library that day - grinning, clucking and shaking my head as I read a very dry looking hardbacked PhD. Rupesh's account of his trip to what it was really like to try to conduct a learning history between two closely related organisations (in his case, Shell & the NGO Living Earth) was fascinating and showed up really interesting issues around power and also areas in the approach that really required attention. Not long after that I arranged to meet Rupesh and we went for a long walk along the canal near Bath. I told him I hoped to do a learning history, not of one organisation but of a handful of organisations across Local Authorities. "What's your common storyline? ", he asked, "you need something that binds them together in some way". 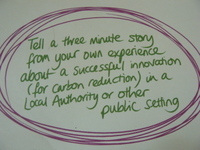 Together we talked about how it could be "The story of how local authorities innovate for low carbon". You can read more about what a Learning History is by following the link.